These days, there are more choices than ever for effective treatment of your varicose veins. Modern varicose vein treatments have come a long way since the old days of vein stripping and other surgical procedures that required patients to be in hospital, have general anaesthesia, and experience long recovery times after their procedures –and often the procedures didn’t even work for very long. Just a few decades ago, most people who had varicose veins preferred to “live with them” rather than seek treatment. That has all changed, thanks to significant improvements in the possibilities for treatment – and for healthier, more attractive legs. One of the most popular treatments is a technique called ultrasound-guided sclerotherapy. For this procedure, we first numb the area with a local anaesthetic, and then we insert a tiny catheter into a varicose vein to inject a sealant. This sealant is a chemical agent that makes the walls of the vein stick to each other, causing the entire vein to collapse. Within a short time, the now-closed vein is absorbed into surrounding tissues, and blood flow is automatically re-routed to healthier veins in the area. A few weeks later, all traces of the veins on the surface of the skin have disappeared. 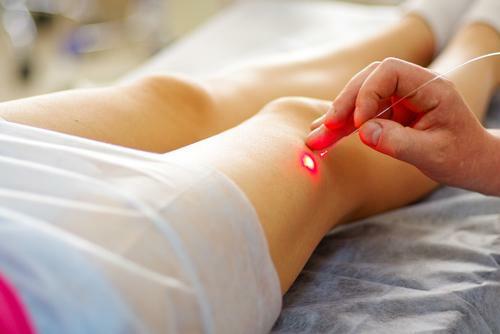 Another example is endovenous laser ablation, which uses the heat from a laser beam to seal shut diseased veins instead of the chemical agents used in sclerotherapy. Like sclerotherapy, the heat is introduced into the diseased vein through a very thin catheter. A related technique is called radiofrequency ablation, which uses the heat of radiofrequency waves to close diseased veins, instead of lasers or chemical agents. These two procedures are well suited for large varicose veins. Like sclerotherapy, these procedures require very little recovery time because there is no major operation to recover from. In addition, we are one of the pioneers in Australia of a modern non-surgical technique called medical superglue (Venaseal™), which uses a tested medical adhesive to safely and effectively close varicose veins. Benefits of this method are that the medical superglue sets within minutes, and there is no need for the prolonged heating process associated with other treatments. How can I find out more about modern, minimally-invasive vein treatments? To learn more about each of these treatment methodologies, you can spend a little time looking over the numerous articles we make available on our blog. Or if you prefer asking your questions directly, just give the team at The Vein Institute a call at 1 300 535 017. We will be happy to answer your questions and help you find the varicose vein treatment that is best for you if necessary.